I stopped in Holbrook for a power nap while driving from Canberra to Melbourne, and to be fair it felt a bit like a power nap kind of town at the time. Located between Little Billabong and Woomargama a bit north-east of Albury, it was quieter than a field mouse which had stumbled into a tomcat convention. But if you’ve ever had a leaning towards white bell-bottomed trousers or just like something a bit out of the ordinary, it’s well worth making a lunch or tea stop here on your journey north or south. Check out its tagline – “The Submarine Town”. There’s a full sized submarine called the HMAS Otway kind of planted in a park in the middle of town. And there’s a Submarine Cafe and a Submarine Museum, which are both in the Submarine Precinct. Now: just for a few seconds, consider the fact that the town is 40km inland and not even close to a major river system. Huh? 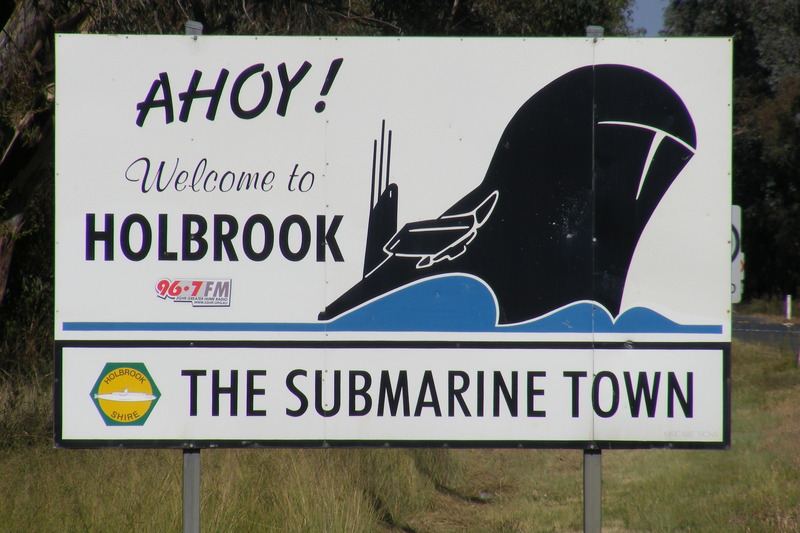 The Holbrook Council’s own website says the Submarine Precinct is in the business of “allowing travellers to experience the size and grandeur of a submarine in a unique rural setting”. Now, I go to the country for a variety of different reasons, but I’ve never once departed for rural Australia with the intention of spotting submersible military vessels. Maybe I’m in the minority. As you’ve probably guessed by now, there’s back story. The town was originally called Germanton back in the 1800s, essentially due to a German immigrant who ran the local pub. The name was changed at the beginning of World War I, when eating sauerkraut in public would have been enough to see you off to the clink for being a German spy. In 1915 it was renamed in honour of a decorated wartime submarine captain called Lt Norman Douglas Holbrook. 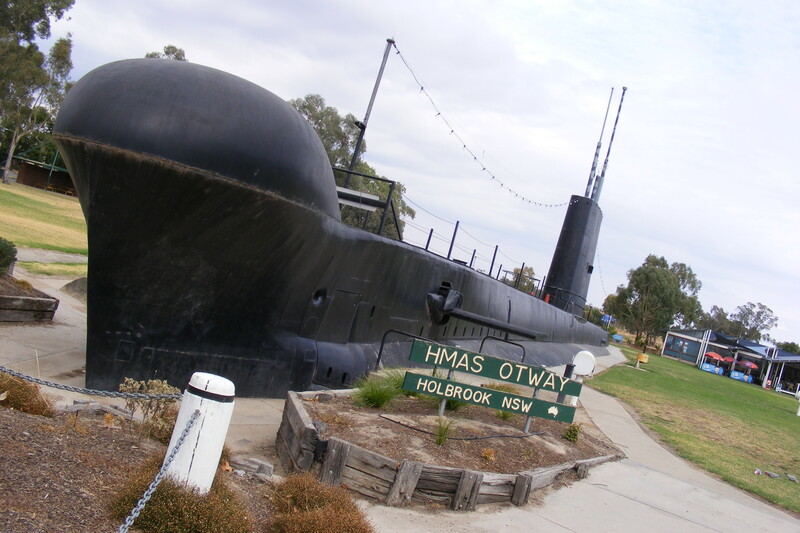 The town and surrounding district of Holbrook held a fundraiser to purchase HMS Otway when it was decommissioned in 1995. But they didn’t raise enough to buy the whole thing, so they negotiated with a scrapyard to buy the outer shell above the waterline. However you slice it, it’s still a bit odd to see a full-sized submarine in a park when you’re nowhere near a body of water larger than a creek. Holbrook’s other claim to fame until 2013 was having the only set of traffic lights between Sydney and Melbourne, but it’s since been bypassed. So if you’re in the area, for God’s sake buy something from the Submarine Cafe or the “pub near the sub” so the whole town doesn’t go under.